After nine weeks of day-long, live reading from 9 a.m. to 6 p.m., the loyal readers at Falvey Memorial Library successfully completed all seven Harry Potter books on Thursday, Dec. 6 at 4 p.m.
Not to be derailed by severe weather, flu season or “pesky exams,” the final (extra) day of reading carried us over the finish line in fine style. We envisioned this multi-week event as a nostalgic look back at a series that helped define a generation, and thanks to the help of a host of readers from all divisions of the Villanova University community, we were more than successful. 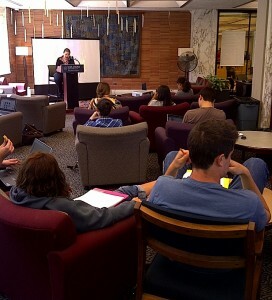 Faculty, staff and student readers, especially the members of the University’s Harry Potter fan club (Epilogue: the Villanovan Order of the Phoenix) and the Villanova Quidditch team took turns at the microphone, lending hours of their personal time to bring J.K. Rowling’s famous stories to life each week in the library’s 24/7 lounge. 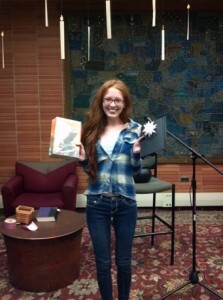 Two of our regular readers won substantial prizes for their loyal participation. 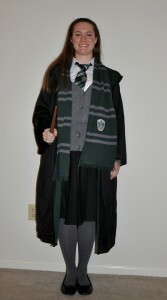 Graduate student Leah Fett won an iPod shuffle for our Halloween Costume contest with her fantastic (and extremely accurate) Slytherin prefect costume. Each reader was also entered into a raffle each time they took a turn reading, and one of our most loyal participants, Chelsea Peláez, won our grand prize: a Kindle with all seven Harry Potter e-books! All and all, our readers came away with fond memories, a rekindling of their childhood love of the Potter books, and a few extra ounces (pounds?!) in the form of tasty snacks, including “authentic” butterbeer, contributed and arranged by our fabulous Outreach team. In addition to all our faithful readers, I would especially like to thank the Falvey staff and student workers for all their time and support. Without their tireless proctoring and reading, we could not have succeeded in this wonderful project.